I wanted to start this post by saying how much I do enjoy writing here, writing my column every Sunday. The option to express my views on different Stardoll issues, updates, releases, and share it on the most popular Stardoll blog. Your feedback is fantastic as well, I try to read each and every comment. It is amazing though, how was I chosen to write here, how my column idea was accepted by Fenia, amongst, I am pretty sure, many members and many ideas; so being chosen was, well, I just can't find the right words now. 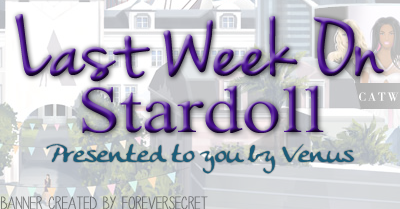 The Tribute month on Stardoll has officially started. (Well, in fact, it started last week with Chanel Decor release.) Next up, Saint Laurent Paris inspired collection. So many styles, shapes, patterns. So much unusual, but unique pieces. Some may seem hard to style at first look, but I am sure you can find a good way to use them in your outfit. Of course, there are some 'simple' pieces, like black leather skirt, leather jacket, or a pink sequin top which would look great with skinny jeans and right accessories. I also love striped dress and galaxy dress. Haven't decided what will I buy, but it defo won't be the whole collection. Some items are just, well, not my style. Time for another Callie's Picks collection, named "Urban Legends"
Ugh.. too many colors. Way too many colors. I really dislike it, and many would agree with me, just check the comments. Mismatched colors, randomly thrown outfits, and of course, several rares, mostly hotbuys. Still, there are some items I do like, like denim skirt, (which I own already though), tartan skirt, and a silver necklace. No offense to Stardoll, but this collection is just not right. Oh, well, better luck next time. After week or 2 ago, when Stardoll brought back many men's clothes to stores without any notice, boys on Stardoll finally got a new collection, store is Mr of course. Well, clothes are okay, I guess. A nice treat for a guys playing this game and actually want to have guy dolls and guy clothes. Or girls who have guy accounts as well, so they could play a bit, experiment with clothes, creating creative outfits. But I think this collection is enough for now. I know female members on Stardoll get more attention, but let's face it, guys are minority on Stardoll, do why spending so much time on designing clothes that much less members will buy? 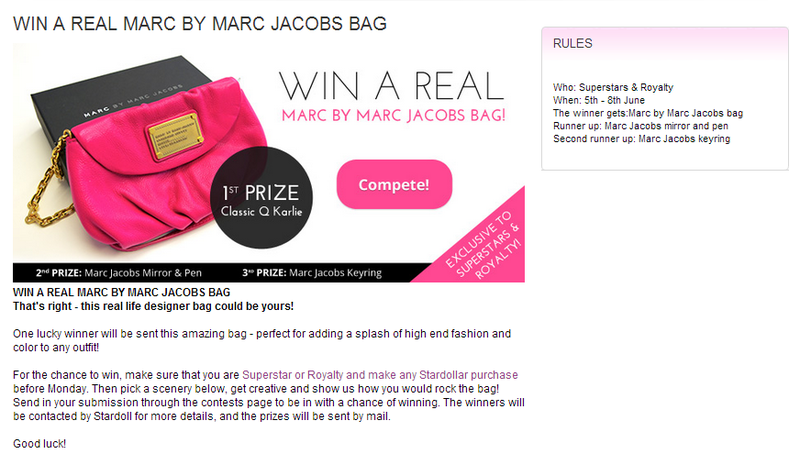 I do not remember having these kind of contests, apart from MSW, where you could actually win a real life item. A designer bag. Fantastic idea, I think. There are even prizes for 2nd and 3rd place, which are not that bad either. All you have to do, as you can read above, is be a superstar/royalty member, and make a purchase of stardollars. And also, create a nice scenery showing how would you wear the bag. And that's the part I dislike, as I am just not too good at making sceneries. But still, I think this is a nice deal, and good luck to everyone participating. Well, that sums up this week, (aside from freebies, spoilers, hotbuys releases, and new design templates, which I do not feel inspired writing about, and aren't either that important in my opinion). What I also wanted to point out is that we usually complain how the week was boring, but we get new releases and some updates often too, each week. But ugh, that spoiler about the update coming. We are still waiting, Stardoll...!! As usual, vote on the poll, and share your opinion in comments.